Debra Dent is a Physical Therapist with 40 plus years of experience specializing in manual therapy of the spine. She is a graduate of the University of Manitoba, Canada, where she received her Diploma of Physiotherapy in 1977 and her Bachelors of Physical Therapy in 1979. Debra was an instructor for the Canadian Physiotherapy Association Orthopaedic Division prior to moving to the USA in 1993. Debra Dent has taught many manual therapy courses in the US and Canada through Cross Border Seminars, Cross Country Education/VYNE Seminars and TLC Physical Therapy and Rehab. She wrote the Segmental Stabilization of the Lumbar Spine for Northeast Seminars Online programs. Debra is the owner of Cross Border Seminars and presently works as a consultant and contract PT in Florida. Her primary case load is Rheumatology and Osteoarthritic patients and she works with a multitude of related dysfunctions, as well as aging and osteoporosis. As I wind down 41 years of practice and look forward to retirement, I can look back and say the best thing I did in my career is the continuing education with the CPA Orthopaedic Division and the work it took to be a certified FCAMPT. This continuing education has certainly enabled me to be a strong clinician and educator. Currently in my career, my primary goal is to assist younger Physical Therapists in gaining insights and education in the treatment of the spine. I am taking several of them on as a mentor either in the clinic that I work in or providing previous students mentoring through distance contact. 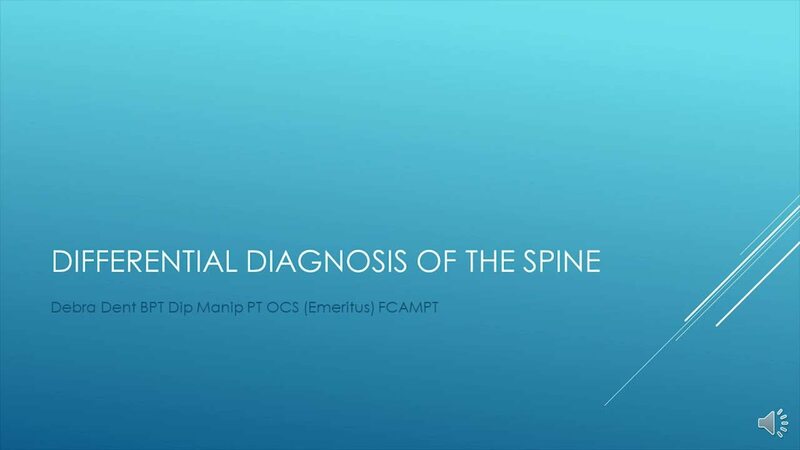 After teaching numerous courses and finding a number of unanswered questions on serious diseases of the spine, I created Differential Diagnosis of the Spine in the hope that no serious issues will go missed in PT evaluations. My secondary goal at this time is to provide education to the public on a topic that I have found to be very effective in improving long term outcomes for my patients and that is improving their breathing mechanics. I am striving to educate people on why correct respiration is so important and the fact that it is easy to change bad practice and habits. I am thrilled to be in partnership with Embodia. Presently I practice and teach in the USA but I was originally trained in Canada, so as I wind down my forty-one years as a Physiotherapist, I am pleased to return to my roots. This past year I have been concentrating on developing online seminars instead of being on the road teaching. After a while, all airports look the same. I have appreciated the opportunity to partner with Embodia and to bring my seminars to a larger audience who can study at their convenience. I have a number of topics that I love to teach, and one is Differential Diagnosis of the Spine. I wrote this seminar due to concerns I had while teaching another topic. I would ask specific questions on symptoms and signs of certain pathologies and the response I received was questionable. One day that patient will arrive at your clinic. Their symptoms may mimic an orthopaedic issue, but something else may be lurking behind those signs. Why do I say that? Because I have found a number of serious pathologies such as cancer, MS, fractures, infections and serious inflammation in people who walked in my door with or without seeing an MD first. These people are infrequent, thankfully, but they are out there. If this seminar keeps different pathologies and their signs and symptoms that we studied in school in the back of our minds, it has achieved its purpose. The goal of this book is to assist the Physiotherapist in protecting the patient from being misdiagnosed and having their condition or disease progress without undergoing treatment in a vital time frame. I hope you will join me for this seminar.